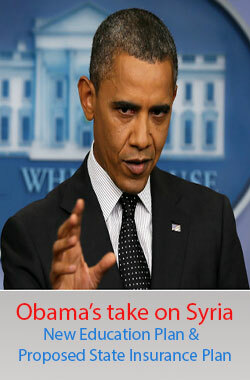 Obama's take on Syria attack - education plan - Insurance initiative, publicity stunt or a thought full planned approach. It seems President Obama is in the mood of getting more popular day on day - everything that he does - decides to do is been looked at as a publicity campaign. Newspapers have been reviewing all moves of president Obama - some in a critical manner whereas others in a sympathetic stride. CNN news published a report where they have portrayed president to be in a state of dilemma due to Syria issue - he is becoming a president; he does not like. Although the situation is really critical and warrants a lot of attention and careful review of the overall situation before any decision is being made. Nearly all the newspapers have said something or other in favor of president which happens to be a feel good factor. It is so because 20th of August when president Obama announced the new education plan to get effective 2018, has been a phase of turmoil for all traditional educationalists who have been running like headless chickens since then, due to lack of appropriate updates and rule books about the grading systems. Meanwhile as a result of the education plan announced by President Obama - the colleges have started preparing themselves - which whatever limited knowledge they have, to get graded by federal plan in order to pull up maximum financial aid, they can. The outcome or an overview of the education plan says that ranking colleges would ensure that students attending low scoring (low grade as per federal plan) would attract less financial aid from the tax payers. This also means that the schools and colleges who prove to be non performers’ basis the new federal law parameters might end up with Zero financial aid from the state funds - this could be a devastating situation for public universities. The American education department is yet to finalize and roll out the scoring grid for the proposed system - but experts say whatever comes out as Halloween is going to affect a lot of schools and colleges in numerous positive and negative aspects. Low marks as such damage school’s enrollment count leading to loss of lots of tuition dollars– while at the same time state funds also gets chopped off, leaving no way of survival for such schools and universities. The scoring is supposed to be initiated in the beginning of 2014 - with a road plan that by end of year 2018 - new legislation would be well equipped to tie up federal financial aid with a school's score yielding results in form of low financial aid) to low scoring schools. Simultaneously widely known state insurance exchanges mandate - the healthcare initiative by President Obama government - Countdown to Obamacare Rollout is to be rolled out and go live by 1st of October - at least that’s the go live date suggested for this new health care law. The politics and political sentiments are it seems at all time high in America due to these suggested plans and actions by President Obama - situations and circumstances is what will give a clear view of times ahead for Americans.